Fact #1: Cristiano Ronaldo is a good looking man. Fact #2: The Cristiano Ronaldo statue is a poor representation of Cristiano Ronaldo. Fact #3: Fact #2 is not important. I feel strongly that this is a positive for Cristiano Ronaldo. He’s one of the best looking men on planet earth, and no statue or replica will ever do him justice. Obviously this statue is a complete disaster and looks like it was made of clay and then sat upon by someone. 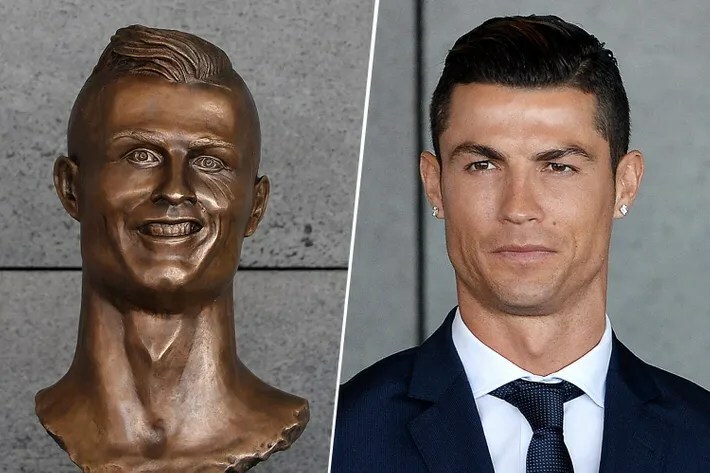 But the first thought that comes to mind when seeing the statue is “that looks NOTHING like Cristiano Ronaldo”, which brings me back to my thesis. That is good for Cristiano Ronaldo. This subpar portrayal of the Portuguese star makes it more evident than ever at just how good looking he really is. By seeing an ugly version of himself next to his actual face, it’s validation that he’s a stud. The fact that a statue was made of him is far more important. There are wax statues, posters, action figures, and bobbleheads depicting Cristiano Ronaldo all over the world. They’re not all winners, albeit this more likely than not the worst of the bunch. Nobody’s disputing that this is a fail of epic proportion. But having fans around the globe obsess over you and make statues of your face is an obvious W. Doesn’t matter what the final product is when in real life you have the face, the bone structure, the hair, the skill, and the complexion of Cristiano Ronaldo. The worse the replica is, the better looking he actually becomes.